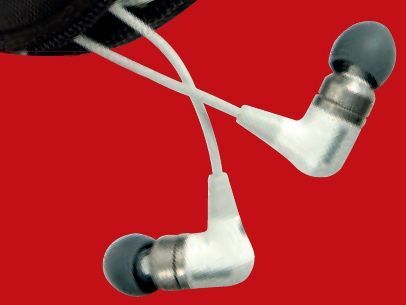 Must-buy earbuds for those who like quality sound and can afford the pricetag! If you can cope with the weighty price tag, the Shure E4c Sound Isolating Earphones deliver a remarkable experience for the passionate audiophile. The quality of the sound and the extent of the noise blocking are dependent on how closely the bungs fit against the ear canal. If the bungs don't fit tightly then you won't experience any bass effect at all. Shure has provided a comprehensive means of ensuring that you get the best fit possible - the E4cs come with no less than four different types of bung, each type coming in various sizes. If, somehow, none of the plastic styles fit you, there's a set made of foam that will expand to fill every contour of your ear. The standard sleeves worked best for us. They produce an airtight fit that feels strange upon insertion, but are comfortable once they're in place. These earbuds are designed to be worn with the cord looped over the top and behind the ear, which is fiddly to orchestrate for the first few attempts, but becomes easier with practice. Once you've got them properly fitted into your ear the noise-blocking effect is excellent. The sound is crystal clear with plenty of bass and you can pick out a fine level of detail in your music. It's a full, rich, immersive experience.